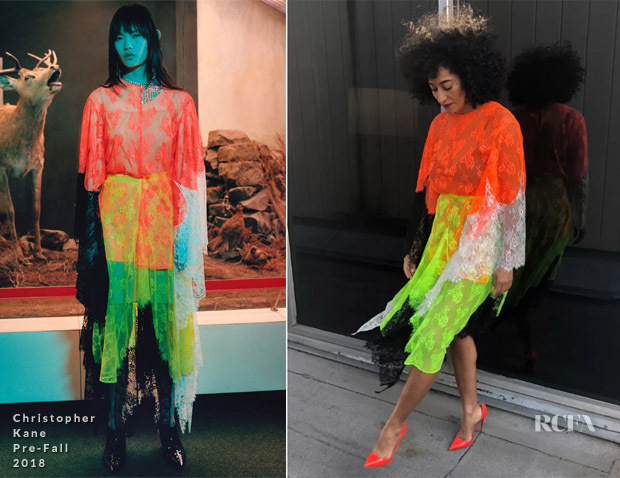 After her appearance on ‘The Ellen DeGeneres Show,’ Tracee Ellis Ross was on the ‘The Late Late Show with James Corden’ on Monday (April 16) and showed off her eye-popping look on Instagram. Anyone who was half-asleep whilst watching the late-night show would have surely been jolted awake with her Christopher Kane Pre-Fall 2018 neon lace dress styled with Lana jewels and hot-orange Christian Louboutin pumps. I loved seeing this dramatic, Day-Glo design really come to life on the ‘Black-ish’ star, as she brought such a commanding yet unforced energy to the look. You can likely be rest-assured that it glowed in the dark, too—and I’m now newly inspired to invest in some neon, albeit in slightly smaller dosage.